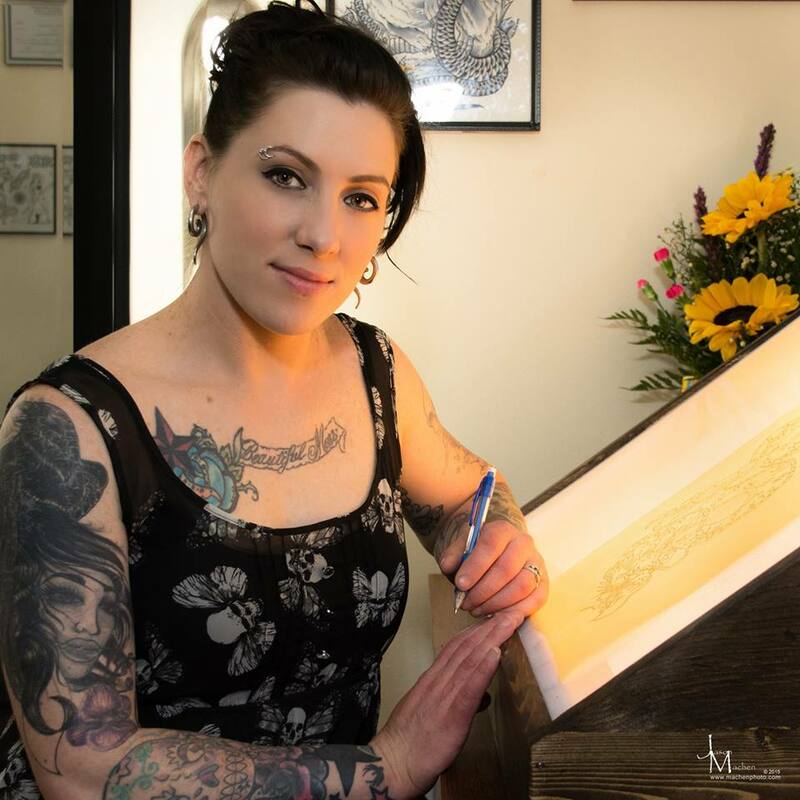 Chico Lou’s Fine Tattoos is owned and operated by Sara Fogle, a lifelong artist from the Athens area. It’s located at 1580 Prince Avenue, in the Normaltown neighborhood of Athens. To book a consultation or an appointment, call (706) 850-6300, or go to the Chico Lou’s Fine Tattoos Facebook page (located here) to send a message. Hey Sarah what’s up.It’s been a long time I didn’t realize you owned your own shop. I need to come by and see you one day. My best friend and I met during our senior year Feminist Criticism class at UGA because our professor paired us as writing workshop buddies. We bonded over a particular poem called “Diving into the Wreck” by Adrienne Rich. My friend currently lives in Chicago (and I am in Atlanta), but this December around New Years, she is headed to town and we wanted to go back to where it started to get the same like “The words are maps.” Tatooed on our bodies (I want to do near my elbow and she wants her right shoulder). I am wondering if we could book you together on the same day and what your availablity is around New Years. Hello Sara, A niece and nephew recommended you. I completed a 100 mile cycling event last week and want to celebrate it with a tattoo. I’ll be in Athens December 9th. I’m clueless about design. The event was “spin for kids” SFK. 10/15/17. Do you help with ideas? Is there a website I might check for design ideas? My name is James, I was referred to you years ago by Amber Grantham, you’ve done 2 of my tattoos and I was hoping you could do another for me. Today if possible. Its fairly simple. I’m looking to get the words “Abisti, Non Peristi” and under that “6/17/49-5/2/18” on my left side rib cage. Its a memorial tattoo for my dad and its very important to me so i only wsnt the best to do it. If you can work me in today please do let me know. My # is (706) 961-1396. HI, James. I’m sorry. I’m currently unable to take walk-ins. Hey my names ashley I would like to know a time of when I could come In and get a consultation? Hi, Ashley. No new client consultations will be availible until January. My name is Daniel and I am interested in setting up a time for a consultation on a tattoo with you. I understand that you are super busy so maybe after the holidays? Either way let me know what works best for you. Thank you for your interest in my work. I’m currently booked through the end of the year so won’t be doing consultations again until January. I don’t want to get too far ahead of myself and forget what we talked about. If you would like to receive an e-mail notification when I’m doing consultations again please sign up. I promise I won’t spam your in-box, just a notification the week before consultations. Also, check the Facebook and Instagram pages for updates when I have cancellations. I would love to come In and talk with you about a tattoo I want on my lower arm. Hi Ashley. Just send an email to Chicolousfinetattoos@gmail.com and either Veronica or Sara will get in touch with you about the best time to come in for a consultation. My name is Josh and I would like to get a tattoo of arrows on the back of my forearm in honor of my children. I have a picture of an example. If you have any spots available I would love set something up.